This morning at Punalu'u beach I was a bit distraught! The previous morning my camera lost all of its electrical functions... no LCD, no autofocus, no white-balance, no changing of ISO, no AEB! All I had use of were its mechanical functions, i.e. changing the aperture and shutter-speed, and depressing the shutter. I had no idea if the images I captured were actually being captured and recorded on my CF card. Fortunaltely, I could still determine the exposure, and adjust my settings accordingly. What made it all the more difficult is that as I increased my f-stop, my view-finder darkened, making it near impossible to focus on anything above f13. So, I had to dial my aperture down, manually focus (a huge challenge for me since I wear strong corrective lenses), and then dial the aperture back up. Without an auto-bracket funciton, I had to manually adjust my exposure +2 and -2 for HDR images. Captured by my dysfunctioning camera. A wall of jungle! 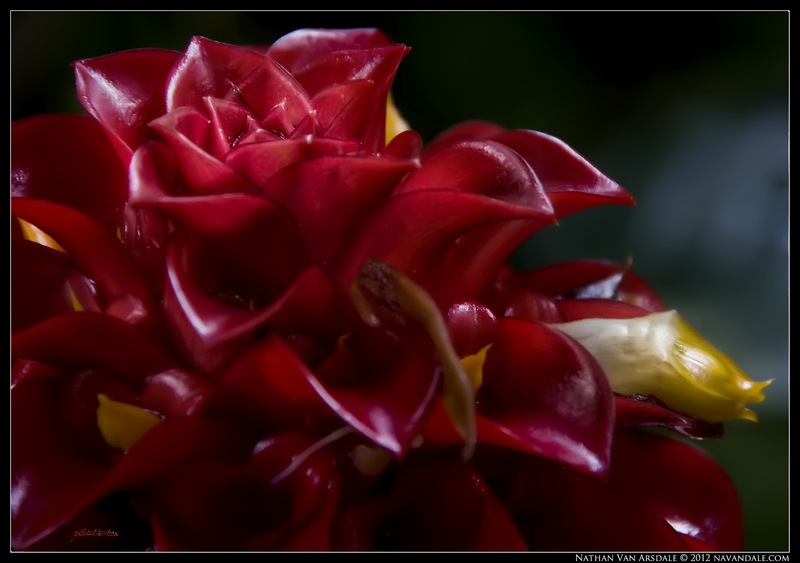 An HDR of Beautiful Parakeet Heliconias. Also captured while my camera was being uncooperative. I had just arrived in Hawaii, and would be there for over a month. I couldn't send my camera in to Canon, because then I would be without it for the duration of my stay. I decided to look at this as a challenge, and utilize my photography knowledge. After shooting with my defunct camera for a day, I was able to at least find power, lug my computer in, and check my CF card. Pfew! Fortunately the images were being written to my CF card... albeit they were all rotated 90 degrees from their correct orientation... but they were being written! So, this morning I was walking the black sand/black rock coast, looking for interesting compositions for the soon-to-be sunrise, and I came upon this honu (sea-turtle), resting on the rocks. It is illegal to touch or disturb sea-turtles in any way, so I made sure to keep a comfortable distance... but I couldn't ignore the compositional opportunity. I quietly asked the gentle reptile if I could photograph it, and slowly it turned and looked at me with ancient eyes, blinked, and rested its head back where it was... just then, my camera beeped five times (a sound I've never heard it make), and all of the sudden the electrical components were restored! Nearly overcome with joy, I photographed this sea-turtle, thanked it, and continued on my way! I suppose it's tempting, when encountering an animal in the wild, to focus just on the animal. That is, to fill the frame with the animal, or try to get a photo with it looking at the camera. Granted, I've certainly taken my fair share of photos of animals looking directly at me, where the surroundings are somewhat ancillary. But I usually try to at least photograph the animal(s) as part of the landscape. This scene, however, spoke to me in a much different way. The turtle was looking into the sunrise, which was shaping up quite beautifully... explosively even. If I were to photograph this turtle head-on, I would be missing out on the beautiful sunrise. Also, were I to photograph this scene with a single exposure, either the turtle would have been very dark, or the sky would have been blown-out. Granted, usually when photographing wildlife it's a good idea to employ a zoom lens, low aperture, and relatively fast shutter speed. However, since the turtle was so still I could use my 18mm wide-angle lens and get pretty close, allowing for the inclusion of the shore, surf, and sky. The beautiful sky had two components that I wanted to capture, the rising smoke from Kilawea (on the left), and the sunburst (on the right). What isn't as apparent is that I am backed up to a wall of gnarly rocks, so I don't have much room to maneuver. So, in order to make angles on the turtle, the smoke, and the sunburst (at 18mm) proportionally and compositionally pleasing, I had to shoot for a panorama. This would be an easy pano, though. Only 2-vertical frames that overlapped about 60% of each other. I lined up the turtle's gaze to coincide with the "S" curve from the tidewater to the sunburst. So happy that I could again access my AEB (Auto Exposure Bracketing), with my camera on its tripod and using my shutter-release, I auto-focussed - :-D - on the edge of the turtle's shell, then turned the autofocus off. At that point I fired my bracketed shots at f20. I then recomposed on the same horizontal plane a little to the left to include the volcanic smoke, and took my bracketed images at the same exposure levels. 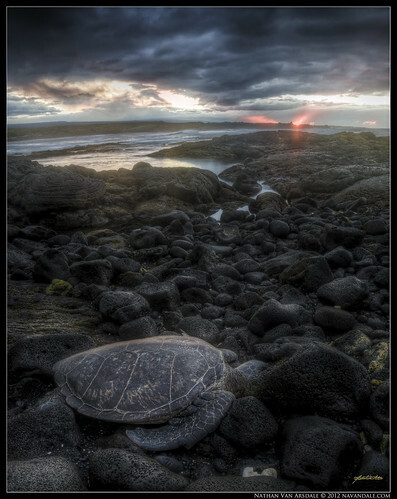 I decided to use the turtle's gaze as a compositional tool, leading the eye to the tidewaters, and then to the sunrise. That way we're looking at what the turtle is looking at, AND, as a photographer, I'm not getting in the animal's way. It's very important, in my opinion, to always ask the animal's permission to photograph it, and then thank it when finished. Granted, the animal can't verbally acquiesce, but I feel like communicating that intention with the animal generates a sense of mutual respect. Never EVER feed wild animals, or try to touch them... not even chipmunks... animals may be cute, but treating wild animals like pets can be very detrimental to their health... but ALWAYS lovingly respect the animals. I am very grateful to be able to experience nature and share its splendor by creating artistic photographs, and leaving only footprints. That's all for today. Thanks for reading. Make sure to check out part 3 of Travel, Magic, and the Letter "S," where I talk about discovering the S curve in landscape composition. Like My Work? Help Support it! Happy Blue Moon! This August starts and ends with a full-moon. In Celebration I am offering 50% ALL print orders. 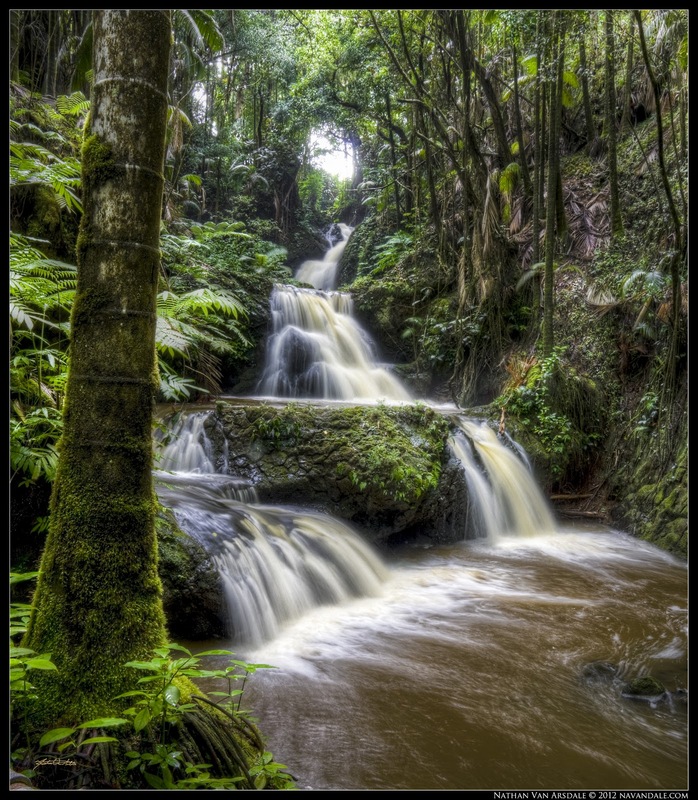 This includes cards, wall-mounts, canvas wraps, metallic prints, and downloads of all fine-art landscapes AND portraits! If you book a portrait session with me during August, I will extend the discount for a week after your images are made available.